Posted on 11, October 2018 by FactMR | This entry was posted in Agriculture, Belgium, Business, Commodities, Denmark, Economy, Financial, Finland, Food & Beverage, France, Germany, Industrial, Ireland, Italy, Netherlands, News, Norway, Poland, United Kingdom and tagged bio-based emulsifier and co-emulsifier, Cationic emulsifiers, Di - Glycerides & Derivatives Market, Emulsification, Emulsifier and co-emulsifier in food processing, Emulsifier and co-emulsifier in personal care, Emulsifier and co-emulsifier market, emulsifier blends, emulsifying waxes, Europe Emulsifier and co-emulsifier market, Lecithin Market, natural emulsifiers and co-emulsifiers, Sorbitan Esters Market, Stearoyl Lactylates Market. Bookmark the permalink. DUBLIN 2, Ireland, 11-Oct-2018 — /EuropaWire/ — The unwavering consumer focus on personal variables such as effects of aging, being conscious about self-image and physical attractiveness has been capitalized by personal care product manufacturers, and as an outcome, new personal care and cosmetic products are introduced to the market on every day basis. Furthermore, personal care and cosmetic product manufacturers have also shifted towards ingredients that impart multi-functional properties to products. Among various types of such ingredients, including but not limited to, modifiers, emollients, and stabilizers, emulsifiers and co-emulsifiers are witnessing a surge in demand, especially from the cosmetics and personal care in Europe. 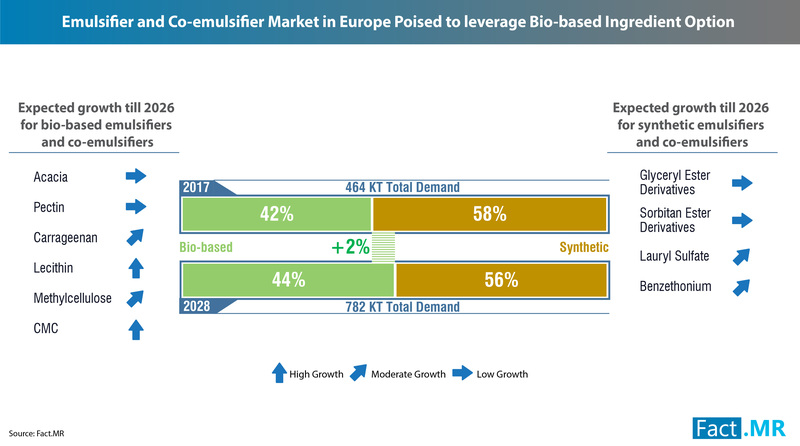 According to a Fact.MR study, Europe accounts for nearly 40% revenue share of the global emulsifier and co-emulsifier market. Fact.MR, a global research and advisory firm, tracks markets in Europe, Americas, and emerging regions. Fact.MR offers research services across the entire spectrum, with specific focus on automotive, healthcare, food & beverages, industrial goods sectors in Europe. Headquartered in Dublin 2, Ireland, Fact.MR has delivered efficient research solutions to micro, SMEs, and large corporations in Europe and beyond.